Since the political jobbers in Igbo Land of Biafra popularly known as OhanezeOhanezeZ Ndigbo have the temerity to challenge Biafrans all over the world who have given their mandate of loyalty to the leadership of Mazi Nnamdi Kanu (De Great) until Biafra is restored by speaking against IPOB "No Election" campaign, It has become an end of the road for Ohaneze Ndigbo. This is because Ohaneze hungry jobbers went to Aso Rock and collected bags of money, of which they can no longer pretend to be supporting our quest for Biafra referendum side by side with the collected money. 1. Who are these masquerades parading themselves as Ohaneze Ndigbo? 2. 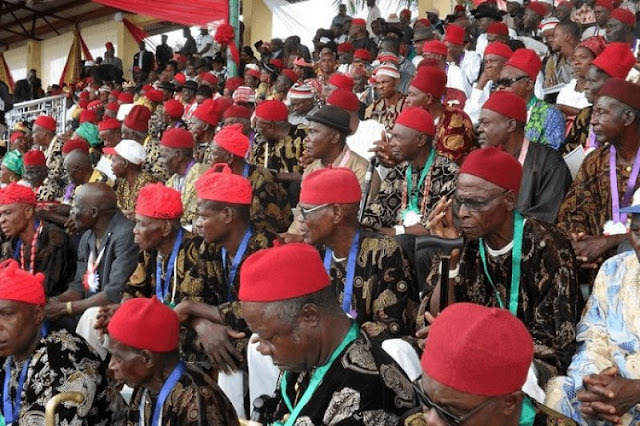 What is the actual number of the members of this Ohaneze Ndigbo? 3. Who and who is at their command in Igbo Land? 4. Who are they representing in the first place? If John "Chameleon" Nwodo and his political colleagues in the Ohaneze Ndigbo, the organization which its influence only exists on the pages of Newspaper cannot give answers to these questions, Indigenous People of Biafra (IPOB) will place them at where Chief Ralph Uwazuruike of shame is kept. How can Ohaneze Ndigbo which is yet to completely purge out of numerous atrocities committed with its name in the days of Chief Gary Enwo Igariwey get up and have the guts to question the authority vested on Mazi Nnamdi Kanu in Biafra Land as the Supreme leader of the people? For the information of Nigerians and the world at large, nobody recognize the mushroom organization called Ohaneze Ndigbo as mouth piece for Ndigbo. If Ohaneze Ndigbo wants to claim that they have any influence on Igbo people of Biafra, let them give order to the people to do something and see how many people that will listen to them. As for the control of the youths and elders of Biafra Land, Nnamdi Kanu has powers to issue orders from the plains of Idoma and Igala lands, which is Northern axis of Biafra Land down to the Bight of Biafra in Atlantic Ocean and it will be obeyed without questions from anybody. As Ohaneze Ndigbo who have never done anything reasonable in planning towards the repatriation of Igbo people back from Arewa Land before October 1st, going by the quit notice given to Igbos living in the Northern Nigeria by the terrorists calling themselves Arewa youths, Ohaneze have chosen to tread on where even Angels fear to tread upon by opening up their mouths against Biafra restoration struggle and Mazi Nnamdi Kanu and the consequences will be enormous on them. Have Arewa Elders in Northern Nigeria ever say anything against their terrorist children who committed treason by giving a sack notice against Igbos and other Biafrans as from October 1st? Yet Ohaneze only hypocritically called for their arrest on a Newspaper page without going to House of Representative to read an address calling for their arrest but can condemn the peaceful road map of IPOB towards Biafra referendum on the floor of Anambra State House of Assembly. The outburst by John Nnia Nwodo who is the newest Ifeajuna of our time, has become intentional suicide and an end of the road for the infamous Ohaneze Ndigbo of shame. Nothing will save Ohaneze Ndigbo from the tragedy facing them at the moment because they committed a sacrilege by opening their mouths against God's anointed servant who is under the protection of Chukwu Okike Abiama. Let them go ahead and collect more money from Aso Rock, it will not stop the resolve of Biafrans who have decided not vote again until Biafra referendum is conducted. Come November 18, 2017, we will show the world who is truly in charge of Anambra state of Biafra Land, whether it is Mazi Nnamdi Kanu (De Great) or the infamous Chameleon called John Nnia Nwodo of shame. The die is cast and the battle line has been drawn. I rest my case!